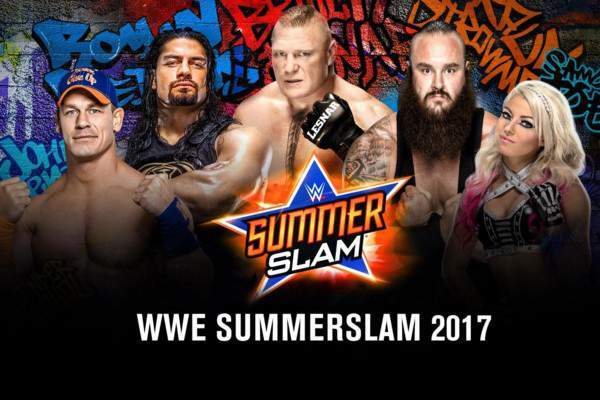 WWE SummerSlam 2017: Here is the list of matches, card, info about the start time, date, predictions, and kickoff show. Also, we have some rumors and speculations listed. Let’s go through this preview of the World Wrestling Entertainment (WWE)’s second biggest pay-per-view (PPV) event. It’s now less than a week left when WWE superstars will go in a jam-packed wrestling show. Almost all the main events have been announced, lately. Still, there is a significant buzz about some more matches and other stuff. There has been no official word from the company. They may end up being just rumors. 1.1 When is WWE SummerSlam 2017 (Date)? When Does It Start (Time)? 1.2 WWE SummerSlam 2017 Live Stream: How To Watch Online? The Miz and The Miztourage win via pinfall. The Usos win via pinfall to become the SmackDown tag team champs. Natalya wins via submission to claim the SmackDown women’s title. Big Cass wins via pinfall. Ambrose and Rollins win via pinfall to become the Raw tag team champions. Styles wins via pinfall to retain the U.S. title. Mahal wins via pinfall to retain the WWE title. When is WWE SummerSlam 2017 (Date)? When Does It Start (Time)? It is scheduled to start at 7 pm ET on Sunday, August 20, 2017. As usual, it will have a kickoff show and it will start at 6 pm ET on the same evening. WWE SummerSlam 2017 Live Stream: How To Watch Online? The fans can watch all the action sequences live on WWE Network, USA Network, SonyLIV and on other networks, different live streaming sites, and relevant apps. It includes fubo TV, etc. The list will be updated soon. click here to watch wwe summerslam live stream online. On August 19, WWE will broadcast its NXT PPV TakeOver. Here is the match card. Watch: Real Madrid vs Barcelona Live Stream. It’s the main event of the match card for 2017 Summer Slam. These four men will display their amazing strengths in this deadly clash. Braun won at the WWE Great Balls of Fire, unlike the other two. Earlier, John Cena was expected to fight for the WWE Championship, but Nakamura defeated Cena and became the No. 1 contender for the WWE title. It will be their fourth time being the title on the line. SmackDown Live commissioner Shane McMahon will be the special guest referee. They had an actual match on Monday Night Raw where Wyatt defeated Balor. Later, Wyatt dumped blood on him. After a while, Balor teased his return on SummerSlam. Baley became the No. 1 contender, but she won’t play due to a shoulder injury. Banks won over Nia Jax on Monday and thus got her chance. Natalya won her chance after victory in a Fatal 5-Way match at WWE Battleground 2017. It will her first ever Women’s championship match. Previously, she had been Divas champion for two months. Perhaps, it will be the kickoff match. New Day won the title at Battleground. There are no other big teams for the title. Thus, this rematch makes a sense. It had been only a few moments after the Ambrose and Rollins reunion when GM Kurt Angle declared a tag team matchup for SummerSlam. Cena came to help when Corbin attacked Nakamura. He put Corbin through the announce table. Then, Daniel Bryan announced the fight. Surprisingly, Tozawa defeated Neville and won the title on WWE Raw. Now, it’s their rematch. Rusev attacked Orton after he had beaten Jinder in a non-title match. Enzo Amore will be suspended above the ring in a shark cage. It could be the kickoff match. The following matches are not official but may become. Jordan attacked The Miz on MizTV after some feud. And considering Angle on Jason’s side, he could a quick shot at the title. Also, it will be weird not to have it at SummerSlam. They can also save it for the next PPV. They have been winning and losing to each other for weeks now. It is likely a kickoff show match. It was expected to become a triple threat match with The Revival, but couldn’t because of an injury. Mahal ekes out another title defense over Shinsuke Nakamura. Natalya upends Naomi to capture the “SmackDown” Women’s Championship. Neville’s reign comes to an end as Akira Tozawa picks up the W.
AJ Styles picks up a win over Owens. Orton beats Rusev in a one-sided affair. The Usos keep their momentum rolling in an excellent title-match victory over the New Day. Wyatt beats the demon-less Balor. Stay tuned to The Reporter Times for more updates on WWE SummerSlam 2017 and other stuff.